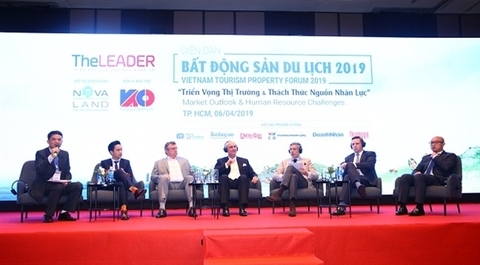 Ha Manh Tien, chairman of the Viet Nam Association of Corporate Directors, told the 2019 Viet Nam Tourism Property Forum that the tourism industry had been growing at 30-40 per cent annually in recent years, among the fastest in the world. Viet Nam received 15.5 million international visitors last year and the number is expected to reach 18 million this year. Ha Van Sieu, vice chairman of the Viet Nam National Administration of Tourism, said the growth in the number of international and domestic tourists had set off a massive wave of investment in resorts, hotels, villas, and tourism apartments in major tourism centres. Viet Nam is forecast to receive 21 million international visitors by 2020 and 47 million a decade later for average growth of 9-11 per cent per year. "The country needs to have 650,000-700,000 rooms by 2020, 950,000-1.05 million rooms by 2025 and 1.3-1.45 million rooms by 2030," he said. Viet Nam has a lot of beautiful landscapes, but many tourists do not known about Viet Nam because the country has not promoted itself well, according to the CEO. Sieu said tourists preferred experiences, and this required investors to develop such products. For instance, a tourism property project could become a complex and be associated with things like a casino, sports, events, and others, he added. Delegates at the forum suggested the country should pay more attention to environmental issues while developing tourism property projects because Viet Nam’s tourism industry heavily depends on natural landscapes and elements, and so environmental degradation could make the future grim for these famous destinations.